Leavers often say they do not understand why Remainers cannot just accept that we are leaving. There are many good reasons, but the one that I keep coming back to is this. Brexit is fantastical. There is nothing about the case for Brexit that is based in reality. This is why everything Brexiters say is either nonsense or untrue. Take, for example, the leaked government estimates of how much poorer we will be on average as a result of Brexit. 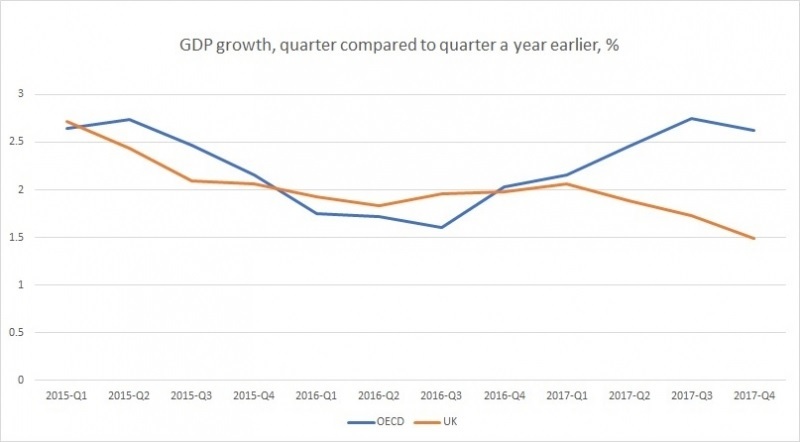 There is no surprise here for economists, because the estimates are in line with the wide range of large negative long term impacts made by various groups or organisations before the referendum, including the UK Treasury. But these new official estimates are made by the department for exiting the EU, and if any massaging went on in producing them it will surely have been to promote Brexit. These new estimates include, for example, the impact of yet to be discussed trade deals with the US and others. The fact that they still come out with numbers that are not very different from those produced before the referendum is, in effect, an official acknowledgment that these earlier estimates were reality based, and not the Project Fear of Brexit spin. So what do we get in response from the government? Just different varieties of nonsense. They say the bespoke deal the UK is hoping to get is not included. As Jonathan Portes notes, this bespoke deal is somewhere between Norway (2% GDP loss) and Canada (5% GDP loss). You have to be totally innumerate not to realise that this would mean a GDP loss between 2% and 5%. And there is the good old ‘all forecasts are wrong’ line. I am tired of inventing new ways to distinguish between conditional and unconditional forecasts, but I guess I will have to continue to do so as long as some political journalists fail to understand the point, and economic journalists fail to make the point. Here is an example for Brexiters. Mr. Fox thinks making trade deals with pretty well anyone he can is good for the economy. That is a forecast. It is a forecast using many of the same elements as those behind the latest official estimates of the cost of Brexit. The reason that deals with all and sundry cannot replace being in the EU is down to gravity, which as Chris notes is one of the most successful and robust ideas in economics. And then there is the even more tiresome “according to economic forecasters the economy was going to collapse” type of argument. I got wise to this kind of thing with austerity. 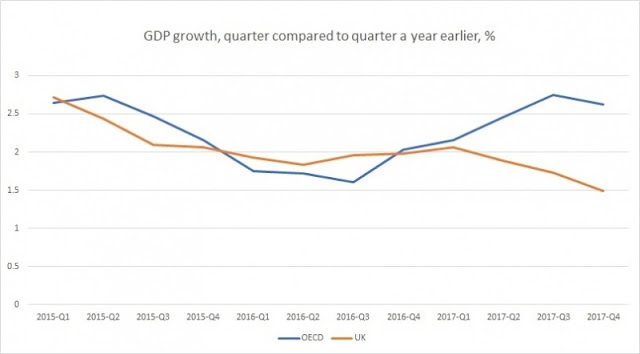 A few allowed themselves to over-egg the impact of the government cuts and that allowed others to declare 2013 growth as a vindication of austerity, just as I predicted they would. In reality austerity caused years of stagnation and the slowest economic recovery in living memory. The reality of Brexit is that we have already lost about 1% of output, as the rest of the world including the EU leaves the UK behind. So the economic arguments of the Brexiters are nonsense: describing them as fantasy gives fantasy a bad name. But why don’t Remainers like me accept that this is really a culture thing, and that Leave voters are willing to pay for their independence from the EU. One reason is that there is clear evidence that most Leave voters believed they would at least be no worse off after Brexit, which is of course why Brexiters continue to try and rubbish estimates of how bad the hit will be. I’m pretty sure those arguing that this is only about culture are not worrying each week about how to make ends meet. But the ‘taking back control’ idea is itself a fantasy. Trade deals today, and the Single Market in particular, are about harmonisation and cooperation. Why is this such a terrible loss of independence when the cooperation is with the EU, but no problem when it is with the US? There is a real debate to be had about the extent to which globalisation erodes national democracy. But this is not the debate the Brexiters are having. Their dislike is with the EU in particular. I have yet to hear a single voter complain about the specific directives that come from Brussels: indeed the UK government often pretend ownership because they tend to be popular. The idea that Leave voters are objecting to a “remote Brussels bureaucracy” imposing standards to keep our beaches and air clean and to prevent workers being forced to work long hours is a myth. Voters would like to take back control, but not from Brussels or the EU. There is even a large fantasy element when it comes to immigration. Yes, there are a few Leavers who would pay a large amount to avoid hearing a foreign language spoken in their town, but they do not represent most Leave voters. Instead there is the belief, carefully cultivated by the Conservative party, that immigration has reduced real wages and our access to public services. Large numbers voted Leave because they thought less EU immigrants would mitigate the NHS crisis. Now those EU immigrants who also happened to be doctors or nurses are leaving, and the NHS cannot fill vacancies. And, of course, those lower growth numbers mean less money to spend on the NHS: the Brexit dividend is negative. Again, a fantasy, this time from the left. He then goes on to list lots of exciting things we can do, most of which we can do more easily inside the EU. For all those who will tell me that the British people knew what they were doing (or rather the 52% who voted Leave), I ask did they really know more than Mr. Marr writing six months later? I suspect you could still find far greater flights of fancy among Leave voters. This is not because people are stupid, but because they soak up the propaganda in their newspapers, propaganda which the BBC is too timid to contradict. In the end, the economics is key to how the Brexit fantasy will end. No sane government or parliament will allow an outcome that makes people on average 8% worse off. That is why we have to make a deal with the EU, and the only deal the EU will allow is one that prevents a hard Irish border. That means staying in the Customs Union and much, possibly all, of the Single Market. Brexit will end with the UK becoming what Rees-Mogg describes as a vassal state. It will not be the fantasy people voted for, nor the fantasy the Brexiters had in mind. When reality bites, almost no one who voted Leave will be happy with the result. So should Remainers stay quiet and just wait for this disappointment to sink in, just for the sake of a particularly partial concept of democracy? To allow peoples lives to be impoverished and their opportunities to be diminished because of a referendum based on lies? There are democratic ways out of this fantasy turned nightmare, and we should take them. Rees-Mogg suggested today to minister Steve Baker that the forecasts produced by government economists made Brexit look costly because civil servants had deliberately designed them to do just that, and Baker made no attempt to defend his civil servants. While this attack on the integrity of the civil service has gone unremarked by No.10, when minister Philip Lee said that the Brexit process needed to take account of "evidence not dogma", he was reprimanded. It is almost as if the government had decided that it needed to show that Brexit was indeed a fantasy project in which evidence, alongside 'saboteur' MPs, 'enemies of the people' judges, 'in the pay of the EU' economists and now 'conspiratorial' civil servants, are not welcome. This distinction is important for reasons that go way beyond the textbook problem with monopoly: that prices are too high and output is too low. To see why it goes beyond that we need to turn to Ronald Coase. He was a British economist who subsequently worked at Chicago. His first major article was "The Nature of the Firm" written in 1937 which introduced the concept of transaction costs to explain the nature and limits of firms. The key point that Coase made relevant for our discussion is that, in theory, much of what firms do could instead be done by markets. For a non-economist this probably sounds strange, so I will briefly try and explain the idea. Much discussion, including my most recent post on Brexit, argues that a second referendum is unlikely on political grounds. But that is very different from the question of whether there should be a second referendum. That is what this post is about. Jenkins implies that holding a second referendum after a renegotiation is fine. What on earth does he think has been going on for the last year and a half. The conceptual difference between a negotiation and a renegotiation is zero. People may well have voted Leave because they believed, as they were encouraged to do, that the UK could get all the benefits of the single market after leaving. Finding out this isn’t possible is not some whimsical second thought, but exactly equivalent to an agreement being renegotiated as far as voters are concerned. Jenkins does concede that “there might, just, be an argument for a referendum after a final deal, purely to confirm it.” You have a choice, as long as you say yes. This accepts the absurd framing of the government that the referendum fixes the decision to leave for all time, whatever the circumstances. There are no conventions that say that. The obvious choice to put to people once the deal is done is whether they still want to leave, now that the best feasible terms for leaving as approved by parliament are known. The vote in 2016 was pretty close, and was based on no clear understanding of what leaving would actually involve. So common sense says that the democratic thing to do is revisit the question once the terms are known. People should be allowed to change their minds. If people are not allowed to do so, and must be bound by that one vote for a generation, then we are no longer a democracy. A popular reposte to the case for a second referendum is why not make it the best out of three. An alternative way of putting it is that the elite wants to keep holding a referendum until voters give an answer they like. But this is nonsense, because in reality what is being argued by the Brexiter elite is not to hold a second referendum because it would probably give the wrong answer from their point of view. Clearly we will only have the chance of one more referendum before we leave: what can be wrong about giving people a second say on a decision that will profoundly influence their lives? Unfortunately, because of the transition period that both sides are so keen on, we will not be able to have a second referendum on the final deal, to confirm or otherwise the first, because the final deal will be done after we have formally left. There is no inevitability about that, because extending the 2 year period for Article 50 is far easier than any transition period. But, as I have argued before, this transition is a democratic affront, precisely because it prevents a second referendum on a final deal. The only democratic response to that affront is to hold one anyway before we leave, on the basis that we now know a lot more about the final deal than we did in 2016. If the polls were showing a larger majority in favour of leaving, then there might be a case that a second referendum was unnecessary, but of course polls are now consistently showing a majority to Remain. Insisting that despite this the 2016 referendum, which was based on almost zero knowledge of what leaving would mean, and where the majority was only 52%, denies any chance of a second referendum is, quite simply, a profoundly anti-democratic act. We have fixed terms for governments for continuity, but Brexit is different: an irrevocable decision which will be with us forever. That makes it imperative that we allow people to change their minds before we leave. The underlying reason why it is a waste of time talking about conventions is that conventions are simply a cover for political expedience. In the UK at least, we have had referendums when the government is hopelessly divided about what to do. Jenkins thinks this possibility is fine because “any trader can influence rules”. Not if they are outside the EU. The naivety here about the influence of the UK outside the EU is worthy of any Brexiter. I have argued that a Norway type deal for the UK is unlikely to be sustainable in the long run precisely because our influence on the EU and world stage generally once we leave will be much diminished. Some people object to a second referendum on the grounds that referendums are generally a bad idea. That is not a debate I want to address here, so it is best to take the statement that the case for a second referendum is unanswerable as contingent on parliament approving any final deal because they do not think they can override the 2016 referendum. It occurred to me that microfounded macro has an issue that is related to that discussion. It is in fact discussed in my OXREP paper, but used there as an example of where microfoundations had gone one step backwards, with only the prospect of going forwards in the future. The example is the derivation of a benevolent policy maker’s preferences from the utility function of the representative consumer assumed as part of the model, a line of research initiated by Michael Woodford. There was only one problem. The simple version of a New Keynesian model that most researchers used implied that inflation deviations were much more important than output deviations. This was very different from the adhoc objective functions that had been used before, where equal weights were commonly used. It also appeared unrealistic: not only did policy makers not act as if inflation was all important in reality, but consumers in happiness studies tended to rate unemployment as more important than inflation. That was the step backwards that I mentioned earlier. But what it also did, I think, was to make less transparent the value judgements that the researcher was implicitly making. Everyone, including policymakers, know that macro models are huge simplifications, but to get interpretable results that is what you have to do. Yet they also have some idea of their preferences between excess output and inflation. But if the policymaker’s preferences were now endogenised, they would generally get welfare results presented to them with no choice to make involving their own preferences. Researchers were not hiding anything. The utility function of the representative agent was there to see, and most papers would show the derived objective function with a low relative weight on output deviations. But what was often not shown was how the results would differ under alternative objective functions: why would you as a modeller committed to microfoundations, as to use any other weights than those implied by the model was internally inconsistent. Thus internal consistency took a value judgement away from policy makers. Jeremy Warner, an editor at the Telegraph, once said there are either big state people or small state people. I felt the same way following the reaction to the collapse of Carillion: there are either private good, public bad people or public good, private bad people. Of course, reality is somewhere in between. Corillion went bust because of cost overruns or delays in three large construction projects. The nature of such projects involve that kind of risk, but clearly the company - despite its size - was not resilient enough to withstand those failures. It did not go bust because of privatisation of public services, unless you think the government should build its own hospitals or roads. If anything, it shows that those contracting out public contracts were getting a good deal. There will always be public projects contracted out to the private sector. Much of the increase in public investment planned by Labour if it wins the next election will be undertaken by private firms. Getting the contracting relationship right is difficult and fraught with dangers. There is one main benefit of contracting out public services, which is that it can save money. To mention ‘the market’ here is not very helpful, because with one buyer and only a few sellers for something (the contract) agreed once every few years, this is hardly a normal market. It is instead about the incentives faced by managers and workers, both in achieving efficiency and fostering innovation. Managers have a clearer incentive system in a private sector firm to maximise profits, and that incentive is provided by the need to bid low to win the contract and nevertheless make a profit. As Carillion shows, margins on most public sector outsourcing are not large. In that sense Carillion confirms that part of this mechanism is working. A single public sector entity cannot replicate this advantage, unless it too is in competition with private sector firms. In short, competition improves incentives. One important qualification to this argument involves information. The temptation of a bidding system based on the lowest price is to cut quality. So the public sector has to have a clear means of not just specifying quality in the contract, but of ensuring the contract is being fulfilled once it is awarded. Sometimes politics can get in the way of that happening. For activities where quality is difficult to observe, contracting out is not a good idea. Another qualification involves the attitude of public sector workers before privatisation. If they, for whatever reason, internalise the need for efficiency and innovation, because for example they can see how both improve the outcome for customers, then contracting out to the private sector will achieve little. The NHS could be a case in point. A further problem with privatisation is finance. When people argue that public money should not be wasted paying the shareholders or creditors of private firms, they are both right and wrong. They are wrong in the sense that without contracting out the same amount of money has to be raised by the public sector, and so it “wastes” money by having to pay interest on government debt. But they are right in that the rate of interest on government debt is much less than the rate of interest a private firm has to pay on any debt, or in the form of dividends to shareholders. The reason for this is that investors do not like risk: people who lend to the UK government know they will always get their money back, while as the shareholders and creditors to Carillion have just found this is not true for private sector firms. This is why PFI projects undertaken just so that the borrowing is done by the private rather than the public sector are costly from an economic point of view. It is why it makes sense to exclude public investment from any fiscal rule: fiscal rules that restrict public investment are an open invitation to politicians to undertake PFI type financing. In my view the best constraint on public investment is the expected social return, assessed with the help of an independent body. It is often said that PFI type projects ‘avoids risk to the taxpayer’. Again this is the wrong way round. It is far easier and cheaper for the public sector to take risks than the private sector, so PFI projects are paying far too high a price to avoid risk to the public sector. Another problem related to risk is the interrelationship between what the private company contracts to do and what actually happens when government forecasts go wrong, as they always will. This may have happened with the East Coast line “bailout” (but if it was, we should be told), and it did happen with privatising the probation service. Public sector contracting out forces each side to commit to guesses about the future, whereas if everything remains in-house there can be much more flexibility. There is also the cost of having to train more civil servants in the art of writing good contracts. One further problem that Carillion reminds us of is that privatisation runs the risk of a degree of interruption if the company goes bankrupt. Disruption is nothing new. If privatisation is to have any benefits, the contract from the public sector has to come up for renewal every few years, and if the private sector provider is changed that will involve some dislocation of service. One final point, which is contingent on what I hope will be a temporary state of affairs. Nowadays the management overheads for private sector firms are likely to be far higher than in the public sector, for reasons that have little to do with management quality. Ben Chu sets out how much management was being paid at Carillion compared to equivalent public sector managers. And what on earth were shareholders doing allowing the directors to relax clawback conditions on management’s pay if things went wrong, which even the Institute of Directors described as “highly inappropriate” and “lacking effective governance”. In truth the public sector is much better at stopping managers using their monopoly power to be paid over the odds than the private sector appears to be. So the economist’s answer on public sector outsourcing is, it depends: on all the factors outlined above and probably more I have momentarily forgotten. (Like economies of scale and expertise: no one would ever suggest the public sector makes its own paperclips.) Where the balance will be is bound to be case dependent. But it would be incredibly surprising if at least some of the outsourcing undertaken by this government was not ideological rather than evidence based. This suggests that Labour, if it wins the next election, should undertake a thorough independent review when it has all the facts at its disposal. That at least might ease fears that we will lurch from one ideological position to its opposite. This is an interesting example of a longstanding debate with myself. If you want to claim that much of this kind of outsourcing represents neoliberal ideology at work (which it probably does), and also that neoliberalism is all about the market, then your definition of a market has to be pretty wide. But of course a large firm like Carillion, as Ronald Coase said, involves the large scale supersession of the price mechanism. By which he meant that firms are an alternative to markets, and large firms suppress what would be market activity if it was replaced by lots of smaller firms buying and selling to each other. This is a contradiction at the heart of neoliberalism as market worship: firms are alternatives to markets. My last post upset a few people who are campaigning to reverse Brexit, because I was so pessimistic about the chances of a second referendum before we leave in early 2019. They mistook my pessimism for defeatism. I would never suggest that those fighting for a second referendum, or an end to Brexit by any other means, should give up, just because the outlook looks bleak. You can never be certain about how things will turn out. The path to a second referendum is clearly laid out by Andrew Adonis in this Remainiacs Podcast. Two things have to happen. First Corbyn needs to start arguing for a second referendum, which Adonis thinks he will do in the summer or autumn. I think this is conceivable, although far from certain. I would merely note that Remainers who declare that Corbyn will never do so because he is a Brexiter at heart are not only wrong, but are therefore by implication far more pessimistic about Brexit than I am, because this first stage is a necessary condition if a second referendum is going to happen. The second thing that has to happen is that a majority of MPs write in the need to hold a second referendum as an amendment to the Brexit bill, a bill which thanks to rebel Conservative MPs is now a requirement. Yet there is a world of difference between demanding a proper bill before leaving, and demanding a second referendum. The Brexiters will ensure the government throws everything into preventing a second referendum, including perhaps its own survival. As I said in that earlier post, I cannot see it happening in the current environment, and this is the source of my short term pessimism. One of the reasons I am so pessimistic is related to an earlier post, where I talked about how anti-democratic the concept of the transition period is. I could imagine at least some Conservative MPs arguing for a second referendum when the exact nature of the final deal is known. The first referendum was a decision to put an offer in for a new house: now the surveys and council searches are in we can take a final decision. But, because of the transition period, what the final deal will be remains unclear, at least to most of the media and the public. The transition allows the Brexiters to continue to live in a fantasy land, where the final deal keeps all the advantages of being in the EU without any of the costs. I have argued, as have others, that the first stage agreement restricts the scope for what the final deal could look like, but this is denied by the government who are still busy eating cake. There is no reason for this to change in the next year, because the focus will be on the government’s futile attempts to avoid transition on EU terms. In this sense a second referendum will be just like the first: the realists will argue as hard as they can for reality, but reality will either not get a look in with the right wing press, or be balanced against fantasy by the broadcast media. To threaten to bring down their government by voting for a second referendum, rebel Conservative MPs need a cast iron moral case. Alas because of transition they cannot argue that the second referendum will be a vote on the final deal, because the Brexiters can still claim the final deal will be all things to all men and women.